Scone Concrete are manufacturers of a range of prestressed concrete products, including prestressed concrete panels for storage bunkers, retaining walls and transfer stations. 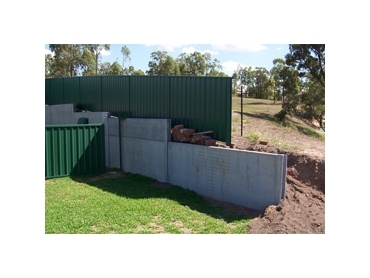 The standard prestressed concrete panel from Scone Concrete measures 3600mm long x 1200mm high and 100mm wide. Variations to this standard size can be made to accommodate smaller panel sections. These concrete panels are prestressed with 30 high tensile wire tendons, plus a sheet of wire mesh, and universal 125H steel columns are also available for wall assembly. quality assurance due to manufacture under Certified Quality Management System ISO9001.